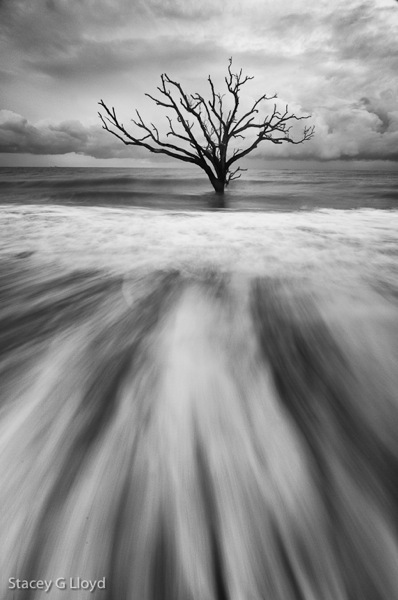 Ever since I saw Tony Sweet’s images of the boneyard off Edisto Island in South Carolina I have wanted to do a sunrise shoot there. A boneyard in this case is a place where there are dead trees along the beach with some standing in the ocean during high tide (due to erosion of the coastline). They are great for creating simple minimalist images – especially at long shutter speeds (several seconds). It turned out that clouds moved in during the night and I didn’t get the sunrise colors I had hoped for, but it still worked out quite well – there were nice dramatic blue-grey clouds. 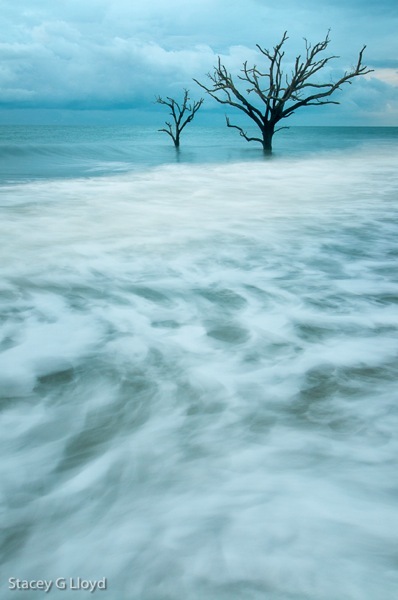 To minimize the texture of the water, use long exposures. 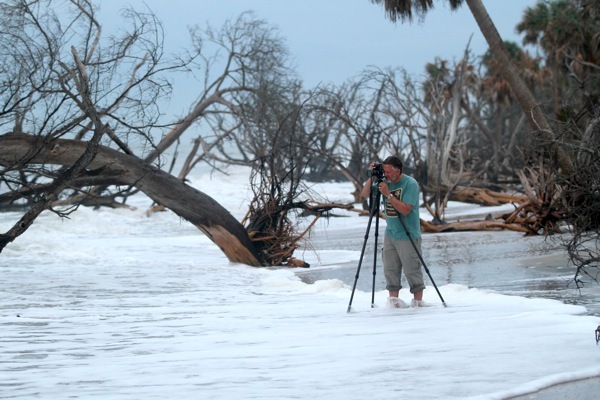 Your tripod will be in the water so make sure it can handle the salt water and sand. My carbon fiber tripod (Gitzo) does quite well. Just rinse it with tap water afterwards and clean as necessary. Waves will tend to undercut your tripod legs and move the camera during the exposures. To minimize this, let a couple waves come and go before exposing (adjust your framing as necessary) – this lets the legs get somewhat settled into the sand. Shoot several exposures to get one sharp one. To create lines moving into the image, wait for the wave to reach its furthest point up the beach before opening the shutter. Use a wide angle lens to accentuate the lines created by the receding waves (see the third blog image below). Collisions between incoming and outgoing waves can create interesting patterns (see the opening blog image). Try several exposure lengths to get the effect you desire. Notice where the white water stops. This will create a strong tonal line in your image. Make it work for you in the composition – use it diagonally (as shown above) or place straight at a 1/3 frame line as shown below. This last image was take by another photographer I met that morning, Stephan Frasier. It gives you a clear overall image of the shooting situation. 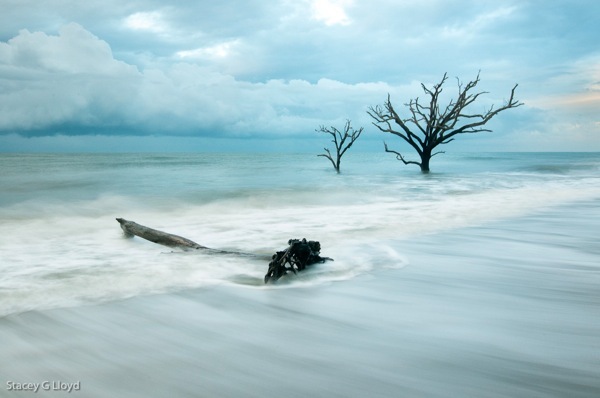 This entry was posted in Composition, How To and tagged boneyard, Botany Bay Plantation, Edisto Island, plantation, South Carolina, Tony Sweet. Hi would you mind stating which blog platform you’re using? I’m looking to start my own blog in the near future but I’m having a tough time selecting between BlogEngine/Wordpress/B2evolution and Drupal. The reason I ask is because your design and style seems different then most blogs and I’m looking for something completely unique. P.S Sorry for getting off-topic but I had to ask Read Full Report! I use a Photocrati Theme on WordPress.